What it’s about: They say lightning never strikes twice, but anyone who knows what a lightning rod can tell you is ridiculously untrue. Even so, the odds of a person being struck by lightning twice are astronomical, and the same person being struck seven times beggars belief. But that’s exactly what happened to Roy Cleveland Sullivan, a United States park ranger, who was struck by lightning in 1942, and then six times between 1969 and 1977. Strangest fact: Simply that he survived all seven. In every instance he was burned or otherwise injured, but he always survived. However, over the course of seven strikes, he was burned on his right leg, his head (burning off his hair and eyebrows), his left shoulder, his hair (again), his left arm and leg and his hair (again), his ankle, and finally his head, chest, and stomach. Biggest controversy: Sullivan also claimed to have been struck as a child (probably around 1920), but this is unverified, so neither Guinness nor Wikipedia count it as an eighth strike. He claims he was not injured in the strike, in which lightning hit a scythe he was carrying while helping his father cut wheat. The other seven strikes were all documented by the superintendent of Shenandoah National Park, where Sullivan worked, although two of the strikes happened when he was off the job—he was struck for the third time in his own front yard, and for the seventh while fishing. Thing we were happiest to learn: Sullivan was a survivor in more ways than one. The last time he was struck by lightning, the park ranger was fishing in a pond. A bolt of lightning hit the top of his head, and burned him down to his stomach. As he was recovering from the shock, a bear appeared and tried to steal the trout he had hooked. The 65-year-old Sullivan, despite being severely burned, managed to strike the bear with a tree branch. He claimed this was the 22nd time in his life he had hit a bear, which seems excessive even taking into account his long career in the National Park service. Thing we were unhappiest to learn: Lightning really put in some extra effort to strike Sullivan. While his first strike happened in a lookout tower with no lightning rod—an obvious hazard—Sullivan was driving the second time he was hit. Normally, a metal vehicle acts as a Faraday cage, and protects the driver from lighting by diverting the electricity around the occupant. But the bolt of lightning hit a tree, and was somehow deflected into the truck’s open window, knocking Sullivan unconscious. His truck continued, out of control, and managed to stop just before going over a cliff. After being struck twice more in three years, Sullivan began to believe some force was trying to destroy him, and would pull over his car and lie down across the seat until the storm passed. Nevertheless, the following year, he saw a storm cloud that he said seemed to be following him. He drove away from the storm, thought he had outrun it, but soon after leaving his truck, he was struck by lightning a fifth time. It set his hair on fire and burned his left arm and leg, but by this point, he had taken to carrying a can of water with him for just such an occasion, so he was able to prevent the burns from being more serious than they were. Three years later, Sullivan again believed a cloud was following him and tried to flee, but again, lightning hit, for the sixth time out of seven. Also noteworthy: Even being near Sullivan was dangerous. His wife was also struck by lightning once. She was hanging clothes on a clothesline when a sudden storm appeared and lightning struck her. Her husband was nearby helping, but for once, the lightning ignored him. Best link to elsewhere on Wikipedia: There’s actually a field of medicine dealing with lightning strikes. Keraunopathy deals with the effects of lightning on the human body. Spoiler alert: None of them are good. A bolt of lightning can be as hot as 50,000 degrees Fahrenheit—roughly five times hotter than the surface of the sun. On top of that, the heat causes an explosive shock wave (which we hear as thunder), which can injure people or damage objects being struck. 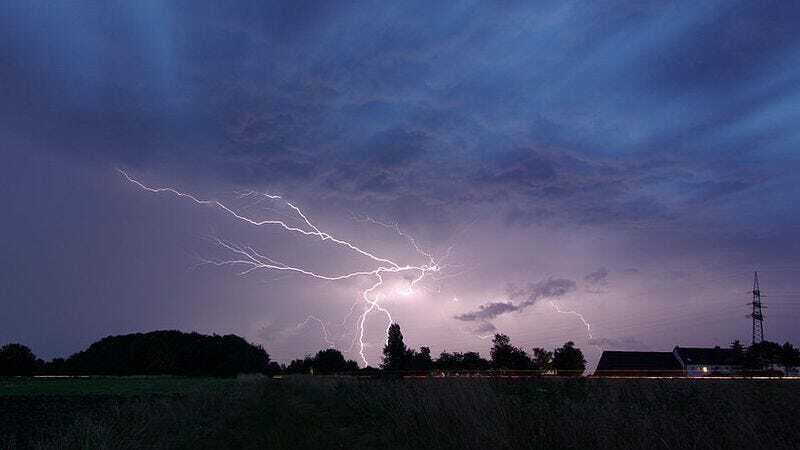 Many lightning strike victims have heard attacks, and some people who are struck in the head suffocate because the shock affects the brainstem, which controls unconscious breathing. Further down the wormhole: While Sullivan was both unlucky enough to be struck by lightning repeatedly, and lucky enough to live to tell the tale, his story still ends in tragedy. Six years after his last brush with lightning, at age 71, he killed himself over an unrequited love. Yearning for someone who does not return your affections is as old as love itself, and 2,000 years ago, Roman poet Ovid published one of the first self-help manuals on the subject, an 814-line poem called Remedia Amoris (The Cure For Love). His strategies included travel, enjoying the outdoors, avoiding love poets, and teetotalism. That last one is an awkward word that simply means abstaining from alcohol. We’ll jump on the wagon next week. Or off the wagon. We can never keep those straight.